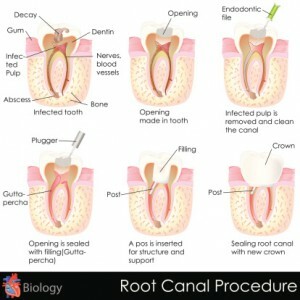 A root canal is a procedure that every patient fears. We understand why – the sound of a dental drill doing its work on a patient’s mouth can be pretty frightening. But, did you know the entire root canal process can often be averted? There are simple changes in your eating habits or other dental habits that can keep your teeth as strong and healthy as possible. At Dr. Joshua Holcomb’s office in Collierville, TN, his team of pros can handle all of your root canal needs, should you need them. We want your mouth to have a strong foundation. Plus, a healthy mouth means a happy smile, and we love dealing with happy smiles. A Root Canal – What Is It? We’ll explain this using real-world terms minus all the medical jargon. Basically, a root canal is the result of a tooth or teeth becoming severely infected. The infection has become so severe that it’s made its way inside of your tooth all the way to the gum line. From there, it’s pretty much all over as your nerves are taken hostage. Curious where most severe toothaches come from? There’s your answer. If you’re experiencing major pain from a tooth, you may be in need of root canal treatment. Our team specializes in root canal therapy and we want you to know that you no longer have to live in pain. Any infection in the mouth is a big deal, and we want to address the problem quickly and with a gentle hand. The sooner we can go in and attack the problem at its root (see what we did there? ), the quicker you can start living in comfort once again. Skipping over treatment will be one of the biggest mistakes you will make. An infection is not something to take lightly. Much like the rest of the body, any infection can spell doom for other parts of the body. In this case, your mouth makes up a significant part of your overall being, and keeping its health in tip-top shape is crucial. If you or a loved one thinks a root canal is needed or are experiencing any type of moderate-to-severe tooth pain, speak with our staff in Collierville, TN and we’ll make sure you get the treatment you so desperately deserve. We invite residents from all over to receive treatment, including Germantown, Pembrook, Memphis, Bartlett, Olive Branch and beyond.